Salt is not just useful for flavoring food, but has over 14,000 other uses, according to the Salt Institute. 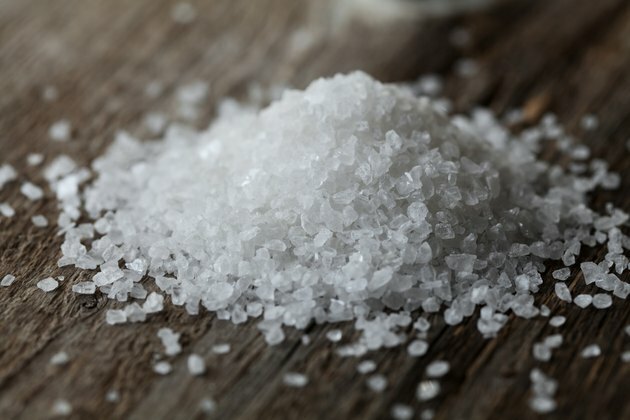 Salt draws out fluid and moisture, and also prevents bacteria from growing. Because of these functions, applying salt to a fever blister may assist in the process of healing a fever blister. Those who have questions about using salt, or any other home remedies, as a treatment option for their fever blisters should contact their doctor. Purchase powdered salt or use a rolling pin to crush regular table salt into a powder. Wash your hands thoroughly. Using an anti-bacterial soap may prove useful. Moisten the tip of your index finger or a cotton swab. Dip your moist finger or cotton swab into the powdered salt. Apply the finger or cotton swab with the powdered salt to the cold sore. Hold for approximately 30 seconds. Pour warm water into a cup. Add a couple spoonfuls of salt to the water. Stir. Dip a cotton swab or the edge of a washcloth into the water. Leave it in the water into it is fully saturated. Place the wet cotton swab or washcloth on the fever blister. Apply slight pressure and hold it there for a minute or two. Repeat a couple times a day until the cold sore heals. If the cold sore is located inside of your mouth, you can also use the salt water to rinse out your mouth instead. The herpes simplex virus, the virus that causes fever blisters, is very contagious. Take precautions to avoid spreading the virus to others while the fever blister is still present, such as avoiding kissing and sharing any item that comes in contact with your mouth, suggests the American Academy of Dermatology.